You can do almost anything on your mobile phone these days from ordering your groceries to booking a round-the-world holiday. And betting sites have been as swift as anyone to embrace the mobile revolution that has taken hold in recent years, giving football betting fans numerous opportunities to place bets when out and about, whether sitting on a bus in a traffic jam or when in the pub waiting for the big match to start. Since the biggest and best bookies in the business (such as the ones featured below) recognised that sports betting fans were likely to want to use their mobile devices to place a bet or two, they have invested heavily to cater to them. The result is that many bookies now have excellent mobile interfaces that work well on more or less any smartphone and often have the same betting options as the desktop versions. The reason any of this is even possible, of course, is because of the advances in the power of mobile handsets and tablets, as well as the capabilities of the mobile networks to transfer more data faster than ever before. As such even activities like in-play betting and watching live streams of football matches can be undertaken on some mobile betting sites. With bookies suggesting more than half of new customers are now using their mobiles to register and bet, we expect even more developments in this area and, this is the good bit, plenty of mobile-specific betting offers and bonuses to encourage your to bet when you’re out and about too! Here we take a look at the bookies we feel have the best mobile betting sites of any in the industry, giving details of the features that make them stand out from the crowd. 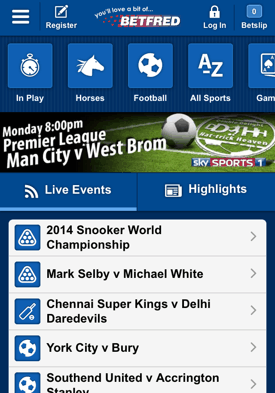 Coral are another well established bookie who have invested heavily in their mobile betting site. To access their mobile betting platform simply visit their site in the browser of your mobile device (though you also have the option to download Apple or Android apps if you so wish). 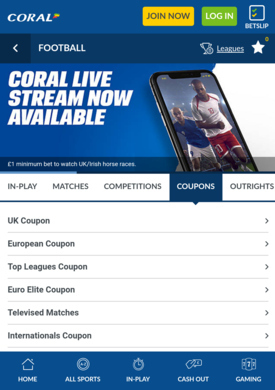 Coral allow mobile customers to bet in-play, watch live streaming of horse racing and place bets on literally thousands of sporting events. With a massive range of football leagues, competitions and markets, and some very competitive betting odds, Coral are a great choice for football betting fans who want to get their bets on before a big match. The mobile site also features live scores, results and details of featured events, and its simple and robust design means placing bets or finding information is never fraught with frustration. Without doubt, Coral have one of the best mobile betting sites around. Betfred have long been at the top table when it comes to sports betting, but they have really embraced mobile betting (and mobile gambling in general). Their mobile betting site has had something of a facelift recently and the interface is much-improved with slicker navigation, a more intuitive betting slip and a new Quickbet feature which negates the need to go to the betting slip at all and is perfect for getting those last minute bets on. As well as their fine mobile offering, we know Betfred are keen to attract new mobile customers because at the time of writing they have an excellent bonus (see Betfred website or our full review for details). With in-play betting and simplified correct score betting available on their mobile site and one of the most user-friendly interfaces of them all, check out Betfred’s fine mobile betting site today to fulfil your football betting needs. 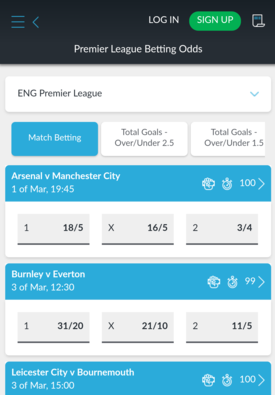 BetVictor have made things nice and simple with their mobile betting site: you can do whatever you can on the desktop version on your mobile or tablet. Whether you want to watch the latest horse racing action or you want to bet in-play on the football match you are watching down the pub or at a mate’s house, BetVictor’s mobile site makes it easy. Available to access directly in your browser or as an Apple app, whether you are on a tablet or a mobile handset, you will find the interface to be clean, simple and devoid of clutter, making your betting experience a pleasant one. For football betting fans, it’s worth knowing that BetVictor have some of the best betting odds on the biggest games of anyone, both for outright match odds and for other markets such as both teams to score and over/under 2.5 goals. So if you are seeking a flawless mobile betting experience with top odds, BettVictor could be the bookie for you. Ladbrokes purchased betting exchange Betdaq in 2013, so as well as offering a conventional fixed odds betting site to mobile users, Ladbrokes also make their exchange available meaning you can choose to place bets or take the bets of others whilst out and about. With a Quick Bet feature, an uncluttered interface and simple navigation, the mobile site from Ladbrokes has everything you need to get your football bets on with the minimum of hassle. And with some great match-specific betting offers popping up all the time, and some fantastic betting odds, especially on the biggest matches, Ladbrokes are definitely one of our favourite bookies for betting on footy. So give their mobile site a go – whether you’ve got an Apple, Android or other device – and see what you think.